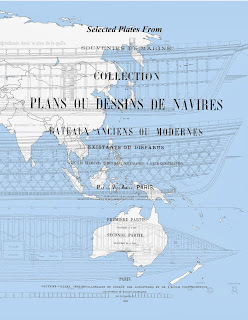 Selected Plates from Souvenirs de Marine brings together 130 ship plans from Pâris's historic work. Vice-Admiral François-Edmond Pâris was a French naval officer who is well known in his home country for his significant contributions to naval engineering during the transition from sail to steam and his leadership of the Musée national de la Marine, but now is mainly remembered outside of France for his detailed books on the subject of naval architecture. Ship model builders and maritime history enthusiasts alike are constantly on the lookout for copies of his books, which can range into the thousands of dollars for vintage editions. However, we have brought together Selected plates from Souvenirs de Marine, plates from "Souvenirs de Marine. Collection de plans ou dessins de navires et de bateaux anciens ou modernes existants ou disparus avec les éléments numériques nécessaores à leur construction" (A Record of Navy: Collection of plans or drawings of vessels and of boats ancient or modern, existing or disappeared, with the numerical elements necessary for their construction.) for just $9.99 on Amazon. Our edition features more than 90 plates from the first two volumes of this set, and feature more than 130 ship plans from vessels ranging from ancient triremes to late 19th Century warships. Vessels from across Europe, the Middle East, Asia, and the U.S. are included. The plates are indexed by plate number, type of vessel, name of vessel, and the country region of the vessel. We've also included a biography of Vice-Admiral François-Edmond Pâris and a bibliography of his works, and an article "How to Read a Ship Plan" that explains how the lines on a two-dimensional plan picture the shape of a three-dimensional ship. Selected Plates from Souvenirs de Marine is a sure hit with the model ship builder or maritime history enthusiast on your holiday gift list!